Studies analyzing the effects of driving under the influence of marijuana have been marked by contradictory research and imprecise measurement. Two major studies published by the National Highway Traffic Safety Administration (NHTSA) in February 2015 shed new light on a topic of increasing concern as 24 states have legalized marijuana (four states and the District of Columbia for recreational use, the rest for medicinal use). According to a recent article in Timemagazine, another five states could follow suit this year. NHTSA’s first report confirmed predictions that legalization might lead to more stoned drivers. In a 2013-14 roadside survey of more than 9,000 drivers, 12.6 percent tested positive for THC (the principal psychoactive ingredient in marijuana,) compared to 8.6 percent in 2007 – a 47 percent increase. The percentage of drivers at or above the legal limit for alcohol w as 8.3 percent, down 80 percent since a 1973 NHTSA roadside survey. Meanwhile, the number of traffic fatalities involving marijuana-stoned drivers has increased in Washington and Colorado since both states legalized the recreational use of the drug, according to two recent reports. The percentage of drivers who used pot within hours of a fatal crash in Washington nearly doubled from 2013 to 2014, according to a just-published AAA study. A similar increase was recorded in Colorado with 10 percent of drivers in fatal accidents testing positive for marijuana in 2011 versus 5.9 percent in 2009. OK, So What’s “Under the Influence”? 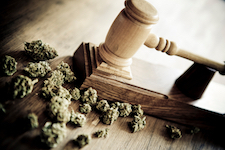 A patchwork of state laws define marijuana intoxication. Findings from these studies underscore another important point in this discussion: Measuring impairment in a person using marijuana isn’t comparable to blood alcohol concentration. “Most psychoactive drugs are chemically complex molecules, whose absorption, action and elimination from the body are difficult to predict,” NHTSA writes, “and considerable differences exist between individuals with regard to the rates at which these processes occur. Alcohol, in comparison, is more predictable.” Some marijuana users can have measurable amounts of THC in their bodies days or even weeks after using the drug, long after any psychoactive effects remain. The uncertainty surrounding the intoxicating effects of marijuana is reflected in the patchwork of state laws defining driving “under the influence” of drugs. Some states follow a zero tolerance standard, making it illegal to have any presence of THC or other illegal drugs in your body while driving. Others set a legal THC limit expressed in nanograms (one-billionth of a gram) per milliliter of blood. In others, impairment is inferred based on the circumstances rather than defined by blood THC levels. To review the laws on marijuana and driving in your state, click here. Of course, no one is suggesting that people should “blaze one and go for a joyride whenever the whimsy strikes,” wrote a New York Times reporter after reviewing the NHTSA study. 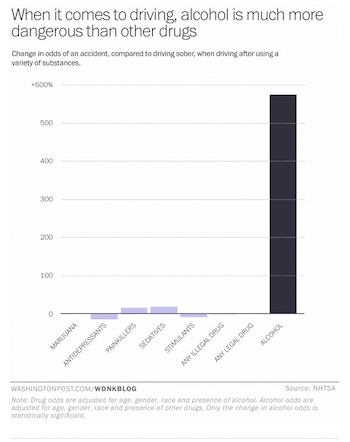 There is plenty of evidence to show that marijuana use impairs driving skills. And as all these studies make clear, we need more research on the effects of marijuana and driving, along with better equipment for detecting and measuring marijuana-related impairment. It is also clear that the science of intoxication surrounding marijuana is different than that of alcohol and may demand a more nuanced response by policymakers, law enforcement and court officers. In other words, stay tuned for more on this evolving topic.